Google Maps is a web-based mapping service application and technology provided by Google. The application provides detailed information about geographical regions, sites, street maps, a route planner for traveling by foot, car, aerial and satellite views of many places in numerous countries around the world. The Google maps API, gives you the freedom to create customized maps, which can do all sorts of cool staffs. We can imagine the Earth as a sphere, so how we described where a points is on it's surface? The most common way to locate points on the surface of the Earth is described by two numbers--its latitude and its longitude. If a ship's captain or a pilot wants to specify a position on a map, they use these "coordinates". These coordinates values are measured in degrees and represent angular distances calculated from the center of the Earth. Imagine the Earth as a transparent sphere with an axis around which it spins. The ends of the axis are the North and South Poles. The Equator is a line which encircles the Earth at an equal distance from the North and South Poles. The latitude of a point on the Earth's surface is the angle between the equatorial plane and a line that passes through that point. As the equator is situated at 0°, the North Pole at 90° north or 90° (a positive latitude implies north), and the South Pole at 90° south or –90° (a negative latitude implies north). Therefore latitude measurements range from 0° to +90° or 0° to –90°. Lines of longitude called meridians, run perpendicular to lines of latitude, and all pass through both poles. Each longitude line is part of a great circle. 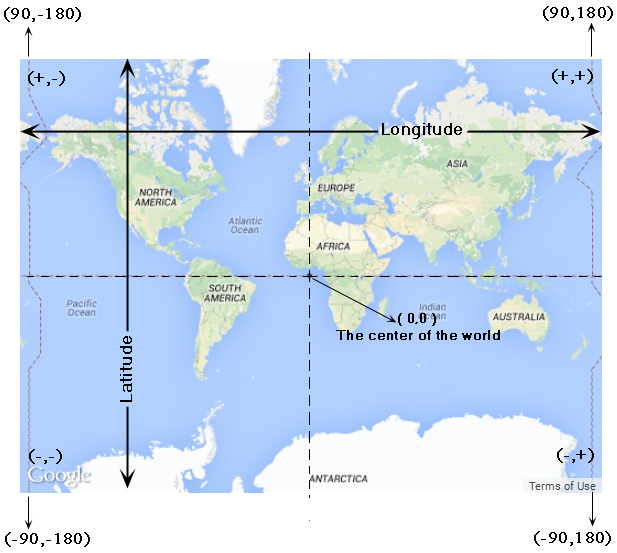 There is no obvious 0-degree point for longitude, as there is for latitude. 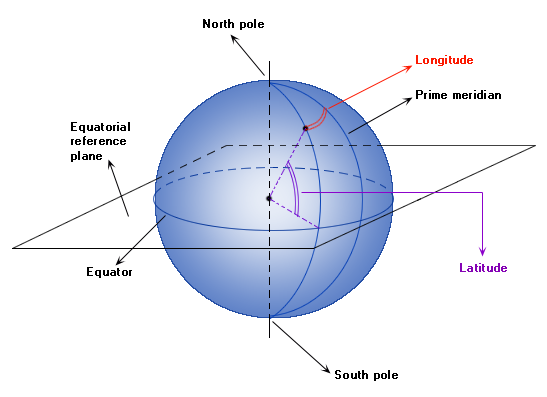 Longitude identifies the east to west location of a point on the Earth, by measuring the angular distance from the Greenwich meridian (or Prime meridian, where longitude is 0), along with equator. Using an API key all Maps API applications load the maps. The API key is free, but Google monitor your application's Maps API usage and if it exceeds the usage limits, you must purchase additional quota. Go to APIs Console at https://code.google.com/apis/console and log in with your Google Account. Activate the Google Maps API v3 service. 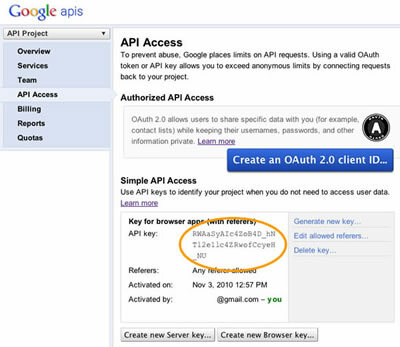 You can use the API key on any site. But it is recommended to use your key in your own domains to prevent use on unauthorized sites. To specify your own domain to use your API key click the Edit allowed referrers... link for your key. Here is a simple map example which displays a map centered on Berlin, Germany. Here we use the simple HTML5 DOCTYPE as shown below. Most current browsers will render content that is declared with this DOCTYPE in "standards mode" which means that your application should be more cross-browser compatible. If you don't use this doctype, the said web page will be rendered in "quirks mode" and may not be able to render some of the features available. It will also make your webpage less cross browser compatible. This CSS declaration indicates that the map container <div> (named map-canvas) should take up 100% of the height of the HTML body. <>Where LatLng object holds the latitude and longitude of Berlin and "center" is used to center the map on this specific point. Zoom: The zoom property sets the current zoom level.